The missiles saw only brief ICBM service, and the last squadron was taken off operational alert in 1965. 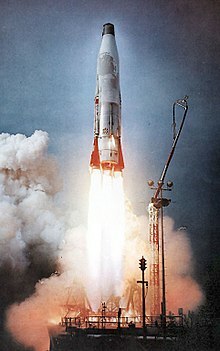 From 1962 to 1963, Atlas boosters launched the first four American astronauts to orbit the Earth whereas Redstone preceded Atlas with two sub-orbital launches. Various Atlas II models were launched 63 times between 1991 and 2004. There were only six launches of the Atlas III, all between 2000 and 2005. The Atlas V is still in service, with launches planned until 2020. The Atlas name was originally proposed by Karel Bossart and his design team working at Convair on project MX-1593. Using the name of a mighty titan from Greek mythology reflected the missile's place as the biggest and most powerful to date. It also reflected the parent company of Convair, the Atlas Corporation. More than 300 Atlas launches have been conducted from Cape Canaveral Air Force Station in Florida and 285 from Vandenberg Air Force Base in California. The first successful test launch of an SM-65 Atlas missile was on December 17, 1957. Approximately 350 Atlas missiles were built. Many were eventually converted to orbital launch vehicles after they were removed from service as missiles. Early Atlas rockets were also built specifically for non-military uses. On December 18, 1958, an Atlas was used to launch the Signal Communication by Orbiting Relay Equipment (SCORE) satellite, which was "The first prototype of a communications satellite, and the first test of any satellite for direct practical applications." The satellite broadcast President Eisenhower's pre-recorded Christmas message around the world. The Atlas boosters would collapse under their own weight if not kept pressurized with nitrogen gas in the tanks when devoid of propellants. The Atlas booster was unusual in its use of "balloon" tanks. The rockets were made from very thin stainless steel that offered minimal or no rigid support. It was pressure in the tanks that gave the rigidity required for space flight. In order to save weight they were not painted and needed a specially designed oil to prevent rust, this was the original use of WD-40 penetrating oil. The SM-65 Atlas was used as a first stage for satellite launch vehicles for half a century. Many were eventually converted to orbital launch vehicles after they were removed from service as missiles. Missiles converted into Atlas E/F "space boosters" were used to launch the early "Block I" GPS satellites. Atlas boosters were also used for the last four manned Project Mercury missions, the first United States manned space program. 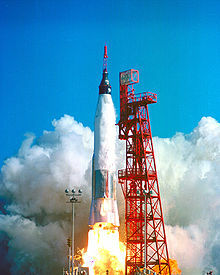 On February 20, 1962 it launched Friendship 7, which made three Earth orbits carrying John Glenn, the first United States astronaut to orbit the Earth. Identical Atlas boosters successfully launched three more manned Mercury orbital missions from 1962 to 1963. Beginning in 1960, the Agena upper-stage, powered by hypergolic propellant, was used extensively on Atlas launch vehicles. The United States Air Force, NRO and CIA used them to launch SIGINT satellites. NASA used them in the Ranger program to obtain the first close-up images of the surface of the Moon and for Mariner 2, the first spacecraft to fly by another planet. Each of the Agena target vehicles used for the later space rendezvous practice missions of Gemini was launched on an Atlas rocket. The Atlas-Centaur was an expendable launch system derived from the SM-65D Atlas missile. Launches were conducted from two pads of the Launch Complex 36 at Cape Canaveral Air Force Station, Florida. A specially-enhanced[how?] version of the Atlas D vehicle for mating with Centaur stages; the Atlas's engines were upgraded and the structure reinforced for the large upper stage, along with elongated propellant tanks. Beginning in 1963, the liquid hydrogen-fueled Centaur upper stage was also used on dozens of Atlas launches. NASA launched the Surveyor program lunar lander spacecraft and most of the Mars-bound Mariner program spacecraft with Atlas-Centaur launch vehicles. Atlas I 1990 1997 11 8 Atlas G derived Centaur D1A derived CRRES Same as Atlas G except strengthened for 4.27 m payload fairing and ring laser gyro added. Atlas II 1991 1998 10 10 Atlas G derived Centaur D1A derived Eutelsat Same as Atlas I except Atlas stretched 2.74 m, engines uprated, added hydrazine roll control, fixed foam insulation, deleted verniers, and Centaur stretched 0.9 m. Development done by General Dynamics (now part of Lockheed Martin). The first stage of the Atlas III discontinued the use of three engines and 1.5 staging in favor of a single Russian-built Energomash RD-180 engine, while retaining the stage's balloon tank construction. 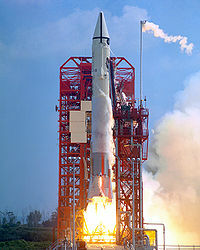 The Atlas III continued to use the Centaur upper stage, available with single or dual RL10 engines. The Atlas V, currently in service, was developed by Lockheed Martin as part of the US Air Force Evolved Expendable Launch Vehicle (EELV) program. The first was launched on August 21, 2002. In 2006, operation was transferred to United Launch Alliance (ULA), a joint-venture between Lockheed Martin and Boeing. Lockheed Martin continues to market the Atlas V to commercial customers. Atlas V is built in Decatur, Alabama and maintains two launch sites: Space Launch Complex 41 at Cape Canaveral Air Force Station and Space Launch Complex 3-E at Vandenberg Air Force Base. The Atlas V's first stage is called the Common Core Booster (CCB), which continues to use the Energomash RD-180 introduced in the Atlas III, but employs a rigid framework instead of balloon tanks. The rigid fuselage is heavier, but easier to handle and transport, eliminating the need for constant internal pressure. Up to five Aerojet Rocketdyne strap-on solid rocket boosters can be used to augment first stage thrust. The upper stage remains the Centaur, powered by a single or dual Aerojet Rocketdyne RL10A-4-2 engines. In December 2014, legislation to prevent the award of further military launch contracts to vehicles that use Russian-made engines was approved by the US Congress. The bill allows ULA to continue to use the 29 RD-180 engines already on order at the time. Atlas IIIA 2000 2004 2 2 1xRD-180 1xRL10A Eutelsat W4 major revision of Atlas IIA, with new RD-180 first-stage engine, normal staging, first stage stretched 4.4 m and strengthened. First single RL10 engine Centaur. Atlas IIIB 2002 2005 4 4 1xRD-180 1xRL10A Same as Atlas IIIA, except for Centaur stretched 1.7 m and an optional dual engine Centaur. Atlas V 400 2002 - 25 24 1xRD-180 1xRL10A major revision of Atlas III, with new first-stage structure (CCB) and with optional solid strap-on boosters. Atlas V 500 2003 - 12 12 1xRD-180 1xRL10A revision of Atlas V 400, with optional solid strap-on boosters, and Centaur stage encapsulated inside 5.4 m payload fairing. In 2014, US Congress passed legislation restricting the purchase and use of the Russian-supplied RD-180 engine used on the first stage booster of the Atlas V. Formal study contracts were issued in June 2014 to a number of US rocket engine suppliers. In September 2014, ULA announced that it had entered into a partnership with Blue Origin to develop the BE-4 LOX/methane engine to replace the RD-180 on a new first stage booster. The engine is already in its third year of development by Blue Origin, and ULA expects the new stage and engine to start flying no earlier than 2019. In October 2014, ULA announced a major restructuring of processes and workforce in order to respond to competition from SpaceX. ULA expressed plans to have preliminary design ideas in place for a blending of the Atlas V and Delta IV technology by the end of 2014, to build a successor that would allow them to cut launch costs in half. On 13 April 2015, CEO Tory Bruno announced at the 31st Space Symposium that the new TSTO ULA launch vehicle would be called the Vulcan, after an online poll to select the name. Vulcan Inc. has stated that it holds the trademark on the name and has contacted ULA. ULA plans an "incremental approach" to rolling out the vehicle and its technologies. Deployment will begin with the first stage, based on the Delta IV's fuselage and expected to use two BE-4 engines. Aerojet Rocketdyne's AR-1 engine is retained as a contingency option, with a final decision to be made in 2016. The first stage can have from one to six solid rocket boosters (SRBs), and in the maximal configuration could launch a heavier payload than the highest-rated Atlas V, though still less than the Delta IV Heavy. A later development will be a partly reusable first stage, in which the engines detach from the vehicle after cutoff, descend with a heat shield and parachute, and finally are captured by a helicopter in mid-air. ULA calculates that reusing the engines could reduce the cost of the first stage propulsion by 90%, with propulsion being 65% of the total first stage build cost. Initial configurations will use the same Centaur upper stage as the Atlas V, with its RL-10 engines. A later advanced cryogenic upper stage—called the "Advanced Cryogenic Evolved Stage" (ACES)—will be LOX/LH2 powered by one to four rocket engines yet to be announced. This upper stage will include the Integrated Vehicle Fluids technology that could allow long on-orbit life of the upper stage measured in weeks rather than hours. Another later addition to the Vulcan product lineup is a potential Vulcan Heavy tri-core launch vehicle with 23,000 kg (50,000 lb)-payload capacity to Geosynchronous Transfer Orbit, whereas a single-core Vulcan 561 with the ACES upper stage would have 15,100 kg (33,200 lb)-capacity to the same orbit. Prior to the April 2015 announcement of the Vulcan launch vehicle, during the first decade since ULA was formed from Lockheed Martin and Boeing, there were a number of proposals and concept studies of future launch vehicles. None were subsequently funded for full-up development. Two of those concepts were the Atlas V Heavy and the Atlas Phase 2. The Atlas V Heavy was a ULA concept proposal that would have used three Common Core Booster (CCB) stages strapped together to provide the capability necessary to lift 25 tonne payload to low Earth orbit. ULA stated that approximately 95% of the hardware required for the Atlas HLV had already been flown on the Atlas V single-core vehicles. The lifting capability of the Atlas V HLV was to be roughly equivalent to the Delta IV Heavy. The latter utilizes RS-68 engines developed and produced domestically by Pratt & Whitney Rocketdyne. As of February 2008[update], the Atlas V HLV configuration had been listed in a company document as available to customers 30 months from date of order,[needs update] but no firm plans were ever made to build nor test the Atlas V Heavy. This proposal was replaced in 2015 by the Vulcan Heavy proposal. The conceptual heavy-lift vehicle was called "Atlas Phase 2" or "PH2" in the 2009 Augustine Report. An Atlas V PH2-Heavy (three 5 m stages in parallel; six RD-180s) along with Shuttle-derived, Ares V and Ares V Lite, were considered as a possible heavy lifter concept for use in future space missions in the Augustine Report. The Atlas PH2 HLV concept vehicle would have notionally been able to launch a payload mass of approximately 70 metric tons into an orbit of 28.5 degree-inclination. The concept did not proceed onto full development, and was never built. ^ a b Rusty Barton. "Atlas ICBM Chronology". Archived from the original on 2006-02-04. ^ Helen T. Wells; Susan H. Whiteley & Carrie E. Karegeannes. Origin of NASA Names. NASA Science and Technical Information Office. pp. 8–9. ^ "Project SCORE". Patterson Army Health Clinic. Archived from the original on 2007-06-24. ^ "SCORE (Signal Communication by Orbiting Relay Equipment)". GlobalSecurity.org. Retrieved 28 October 2014. ^ "Atlas E". Encyclopedia Astronautica. Retrieved 28 October 2014. ^ Mark Wade. "Atlas/Agena D SLV-3A". Astronautix.com. Retrieved 28 October 2014. ^ "Atlas Vega". Astronautix.com. Retrieved 28 October 2014. ^ "Delta A". Astronautix.com. Retrieved 28 October 2014. ^ "Atlas-SLV3B Agena-D". Space.skyrocket.de. Retrieved 28 October 2014. ^ "Atlas I". Encyclopedia Astronautica. Retrieved 28 October 2014. ^ "Atlas III Data Sheet". Retrieved 2015-03-18. ^ "Lockheed Martin Ready For Launch Of Intelsat 14 Spacecraft". Lockheed Martin. November 11, 2009. Archived from the original on 17 December 2011. Retrieved 28 October 2014. ^ "Evolved Expendable Launch Vehicle". Afspc.af.mil. March 2009. Archived from the original on 27 April 2014. Retrieved 28 October 2014. ^ Petersen, Melody (2014-12-12). "Congress OKs bill banning purchases of Russian-made rocket engines". LA Times. Retrieved 2014-12-14. ^ "ULA Could Buy as Many as 30 More Russian-made RD-180 Engines". SpaceNews. 2015-01-20. Retrieved 2015-04-13. ^ Avery, Greg (2014-10-16). "ULA plans new rocket, restructuring to cut launch costs in half". Denver Business Journal. Retrieved 2014-10-17. ^ a b "United Launch Alliance Boldly Names Its Next Rocket: Vulcan!". NBC. 2015-04-13. Retrieved 2015-04-13. ^ a b "ULA's Vulcan Rocket To be Rolled out in Stages". SpaceNews. 2015-04-13. Retrieved 2015-04-13. ^ Justin Ray (14 April 2015). "ULA chief explains reusability and innovation of new rocket". Spaceflight Now. Retrieved 16 April 2015. ^ "America, meet Vulcan, your next United Launch Alliance rocket". Denver Post. 2015-04-13. Retrieved 2015-04-13. ^ a b Bruno, Tory (2015-05-05). "ULA Full Spectrum Lift Capability". Twitter.com. United Launch Alliance. Retrieved 8 May 2015. ^ National Security Space Launch Report (PDF). RAND Corporation. 2006. p. 29. Retrieved 28 October 2014. ^ National Security Space Launch Report (PDF). RAND Corporation. 2006. p. xxi. Retrieved 28 October 2014. ^ Atlas V EELV – Lockheed-Martin Retrieved on 2008-02-08. Globalsecurity.org. Retrieved on 2011-11-19. Gainor, Christopher, “The Atlas and the Air Force: Reassessing the Beginnings of America’s First Intercontinental Ballistic Missile,” Technology and Culture 54 (April 2013), 346–70.